Actress Joan Hickson lived in Wivenhoe for a great many years where she was known by her married name of Joan Butler rather than by the name known by those people who enjoyed her 64 year career on the stage, plus over 100 films (not counting films made for television). Of course, to millions of viewers as well as to us who fondly remember her, she had simply become known as Miss Marple, Agatha Christie’s famous detective, in which she starred in the series of 12 films. 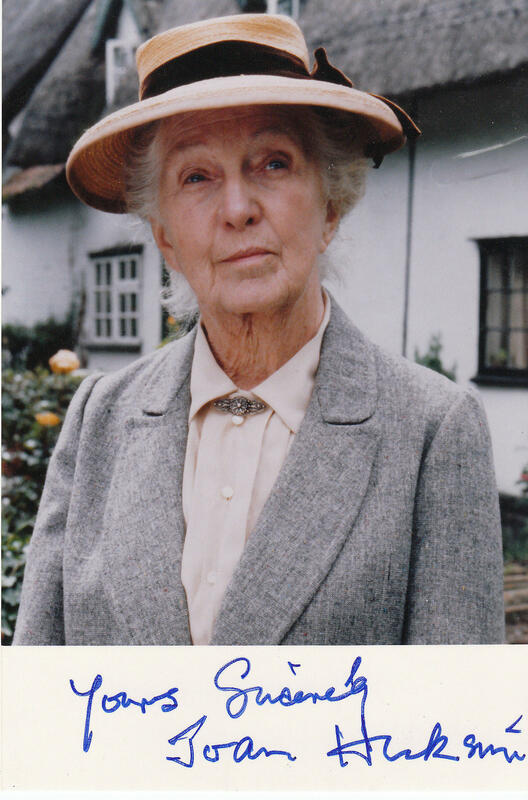 She starred in 12 Miss Marple mysteries, rather at the end of her career, filmed by BBC television. These were seen in more than 30 countries including China and the former Soviet Union. Joan Hickson’s passion for the theatre began at the age of five when she saw Cinderella and was so overwhelmed she didn’t speak for days. She then told her startled family that she must go to live next to the theatre so that she could act whenever the mood took her. The play of the Guinea Pig, which ran at the Criterion Theatre for eighteen months just after the War, was a turning point in her career, as was the subsequent film and the role that she landed in Seven Days To Noon, a character part she thoroughly enjoyed. Parts in other films followed, including Carry on Constable, and the television series The Bell Family and Our Man at St Marks. The Bell Family was originally a series for Children’s Hour, one of the most successful productions they ever did, and it ran to five series. Joan loved working for Children’s Hour. But she didn’t forget the stage: in the ’60s and ’70s, she had leading parts in The Freeway and A Day in the Death of Joe Egg. One of her biggest successes was in Alan Ayckbourn’s Bedroom Farce at the National Theatre in 1977, for which she won a Tony award when it moved to Broadway. Joan made two trips to New York, firstly with A Day in the Death of Joe Egg, and then with Bedroom Farce, and both plays were put on at the Brooks Atkinson Theatre. The latter toured a bit and even reached Canada. The cast of Joe Egg was headed by Albert Finney. In 1983, Christie’s wish came true when the BBC secured the dramatisation rights. Joan went on to achieve worldwide fame as the quietly-spoken but quick-witted Miss Marple of St Mary Mead. 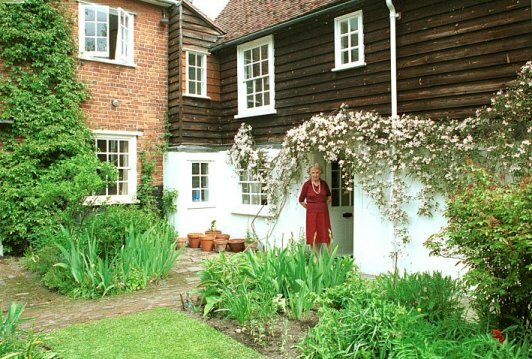 Joan Hickson died on October 17, 1998, a much-loved character in Wivenhoe, where she played herself. THE OLDEST actress ever to take the lead in a major television series, Joan Hickson was a sprightly 78 when she was chosen to play the role for which she will be best remembered, Agatha Christie’s spinster detective Miss Marple. It was the first of 12 murder mysteries in a television series that was to run for eight years, ending only when Hickson insisted on retiring at the age of 86. Previous stars who played the veteran spinster sleuth included Helen Hayes, Angela Lansbury, and Margaret Rutherford (Hickson had a small role in Rutherford’s first Miss Marple film, Murder She Said in 1961), who first popularised the character of Miss Marple in the Sixties and brought the portrayal of eccentric old ladies to a fine art. In 1962 Christie dedicated her novel The Mirror Cracked from Side to Side to Rutherford, “in admiration” – although after the author’s death, it was revealed in her husband, Sir Max Mallowan’s memoirs, that she believed Rutherford was totally miscast as Miss Marple. She was conceived as being a small delicate woman – said to be loosely based on Christie’s maiden aunt – far closer in appearance to the petite and birdlike Hickson, with her piercing, hooded ice-blue eyes, than the more corpulent Rutherford with the expressive face and “the chins”. Marple creates order out of chaos, conducting her own private investigations at a polite distance from the official police murder inquiry. The tools of her trade are frequent cups of Earl Grey tea, her needle sharp eyes and her acute hearing, which enables her constantly to overhear crucial conversations from considerable distances. 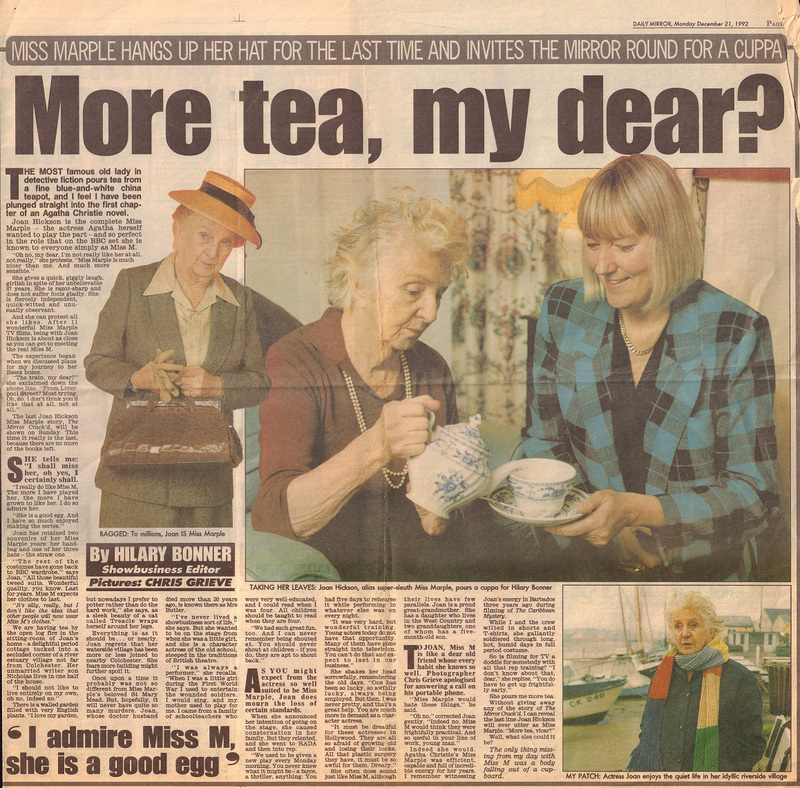 Looking inconspicuous in tweed suits, neat felt hats, lace-up shoes and crocodile-skin handbags, Miss Marple’s manner is friendly and unobtrusive; she often punctuates other people’s sentences with “Oh how kind” and “Oh reaally”. By asking rhetorical questions she answers everyone else’s. In an uncertain world she radiates infallibility. She was born in Kingsthorpe, Northamptonshire in 1906, and taken to her first pantomime, Cinderella, at the age of five. She knew at once what she wanted to do. “I was utterly entranced,” she said later, “and asked my parents to move as near to the theatre as possible. I knew immediately that the life I wanted was there.” Though her family did not encourage her early ambitions, she spent three years at Rada after leaving school. Her first stage appearance was as Lady Shoreham in a provincial tour of His Wife’s Children (1927). The next year she made her London debut at the Arts Theatre as the Maidservant in The Tragic Muse, following this with the role of Miss Mould in A Damsel in Distress (1928). She soon established a flair for comedy, and for playing middle-class housewives, flustered maids and slightly dotty relations. On the set of Michael Winner’s The Wicked Lady (1983), Hickson celebrated 50 years in films, but it was the theatre that gave the actress her finest opportunities, with such roles as Mrs Read in The Guinea Pig (1946) and Emma Hamilton in Rain Before Seven (1949). In 1967 she had a major success in Peter Nichols’s disturbing black comedy about a couple raising a spastic daughter, A Day in the Death of Joe Egg. Hickson made her Broadway debut in 1968 in the same play and repeated her role in the 1970 film version with Alan Bates and Janet Suzman. Another Peter Nichols play, Forget-Me-Not-Lane (1971) gave Hickson another major role which she played superbly, and in 1974 she joined the National Theatre Company. Her performance for them in Alan Ayckbourn’s Bedroom Farce won particular acclaim and when she went to Broadway with it she won the Tony Award as Best Supporting Actress, prompting the Guardian to comment that “This actress has long been undervalued in Britain”. 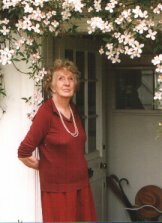 In 1946, Agatha Christie had written the actress a letter after seeing her during a West End production of Appointment with Fear in which Hickson acted the part of “a little spinster lady, saying, “I hope that one day you will play my dear Miss Marple.” Her wish was not carried out for another 38 years. The Body in the Library (1984) was the first of the 12 Miss Marple mysteries in which Hickson starred for the BBC, and which were seen (and still are) in 32 different countries. Jean Simmons, who played alongside her in her final Miss Marple story The Mirror Crack’d (1991), called Hickson “a dear, sweet, soft lady with a sense of humour that you miss if you’re not paying attention”. 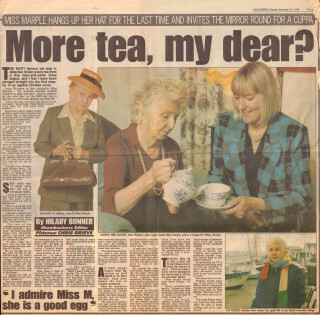 Hickson admired her alter ego enormously and once said of Miss Marple, “I think she’s a wonderful woman with a very clear outlook on life.” Of her screen character, she said, “Miss Marple believes in justice and has very high standards. There is nothing you could say or do that would shock her. “Amusingly vague and properly indiscreet” like Miss Marple, Hickson too enjoyed village life and was averse to change. Joan Hickson, actress: born Kingsthorpe, Northamptonshire 5 August 1906; married 1932 Dr Eric Butler (died 1967; one son, one daughter); died Colchester, Essex 17 October 1998. Note: Chris Goddard, the Webrarian, has posted a picture of Joan Hickson’s gravestone on his page together with some more biographical details about Joan. Click here to see on a separate page. This page was added on 24/03/2015. I loved Joan in The Guinea Pig and as Miss Marple. Great article. I am curious though why Joan was buried in Sidbury, Devon when she spent much of her life in Wivenhoe and died there. Do you know where her husband is buried and why they are buried together? Hello Maxine. I believe she has family in that part of the world which is why she was buried there and not Wivenhoe. I have enjoyed Joan Hickson’s many performances like so many others, so it is lovely to read more information about her. I believe that the home she lived in with her son Nicholas was sold the year after she passed away. I don’t suppose their is a museum in Wivenhoe dedicated to her work and home life? Thank you for this article, I have read it with enjoyment from here in Australia. Glad you enjoyed the piece about Joan Hickson. Her son left Wivenhoe in 1999. Several of us are in touch with him still. Joan was very private person. There is not much evidence of Joan’s life and existence here in Wivenhoe other than a blue plaque on the wall of her former house here. Glad to know our web site is appreciated in Australia.